Tight But Loose » Blog Archive » DAVE LEWIS DIARY: JOHN BONHAM ALWAYS REMEMBERED /OVER EUROPE 1980/QUEEN/BEES/HAPPY 21ST BIRTHDAY SAM! 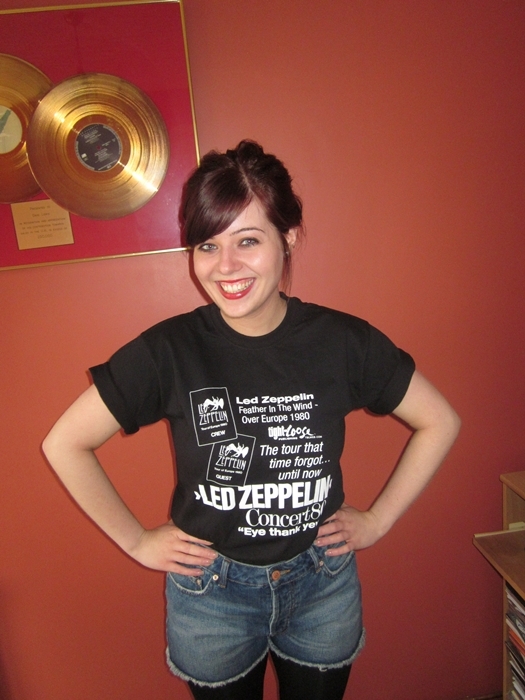 DAVE LEWIS DIARY: JOHN BONHAM ALWAYS REMEMBERED /OVER EUROPE 1980/QUEEN/BEES/HAPPY 21ST BIRTHDAY SAM! John Bonham would have been 63 on Tuesday May 31st – the above photo is one of my favourite of John – not least because I was lucky enough to take it. 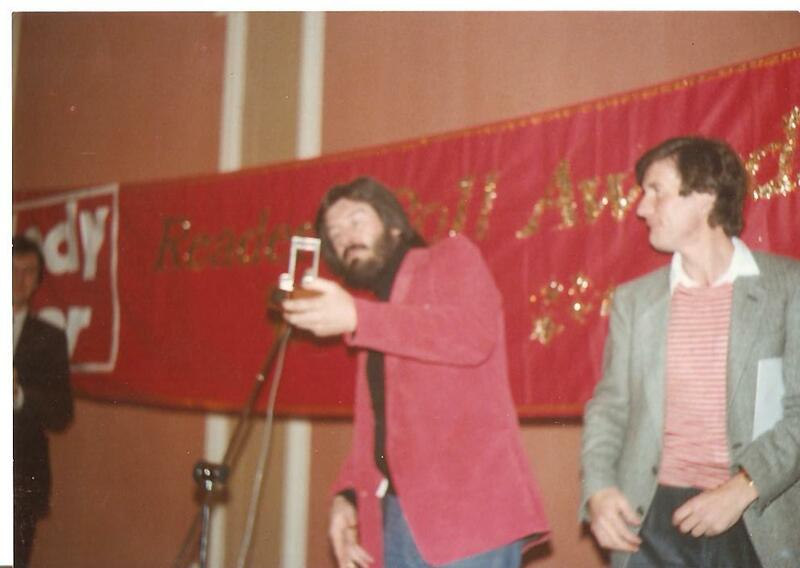 It captures him receiving one of seven awards presented by Michael Palin (on the right) to three quarters of Led Zeppelin on the afternoon of November 28th 1979 at the Waldorf Hotel in London. Surprisingly and somewhat ironically, Bonzo lost out to Phil Collins as top drummer. John was somewhat irked by this. Jason told me a story recently of how he came home from school one afternoon not long after and his Dad requested he get behind the kit and play along to Turn it On Again –the then hit single by Genesis. After a couple of run throughs the boy Jason nailed it – much to Bonham seniors delight. ‘’If a thirteen year old can pull that off, then I’ve got nothing to worry about’’ was his dry summary of the threat of Phil Collins…. That November afternoon John was on great form. My report of the proceedings printed in TBL 4 was the source used for a wide exaggeration of what occurred that afternoon in the Hammer of the Gods book. John did jokingly shout out ‘The Police should have won this’ but he was not drunk or out of control as was indicated in the book. I know because I was there and it didn’t happen. Such inaccurate press reporting was a key factor in the band deciding to undertake a low key tour of Europe the next summer away from the glare of the media. The chronicling of that tour is of course the subject matter (blimey I took two paragraphs to get a plug in!) 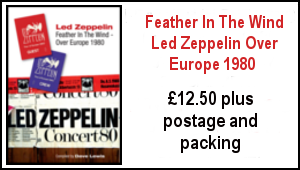 of the book Led Zeppelin Feather In The Wind – Over Europe 1980. Feather in the Wind is simply superb. 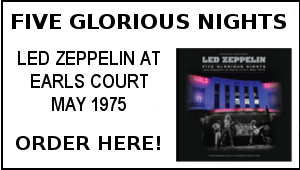 The book is both rich in information and insights on the band, the tour and the times. The text is your finest effort to date. I’d like to publicly thank once again some of the key players in the production of this book: Mick Lowe for a brilliant design, Mike Tremaglio for overseeing so many stages of the text, Larry M. Bergmann jr, Graeme Hutchinson and Nick Anderson for their contributions. Gary Foy being a fantastic sounding board along the way, Tom Locke for capturing it all alongside me 30 years ago and still being an inspiration three decades on, Dec Hickey for his work on scanning the photos, Mark Harrison, Steve Jones, Argenteum Astrum, Tim Kincaid, Gerard Sparaco and Andreas Stocker for their contributions, Cliff Hilliard, Sam Rapallo Jason Sprinzen and Roger Berlin for help with memorabilia, and last but no least Howard Mylett who unlocked many parts of his archive that added so much to the photographic content. 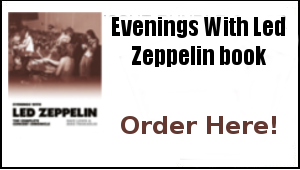 So don’t just take my word for it – as can be viewed from the comments above, this book is an essential addition to the Zep bookshelf. The book is on offer at a special opening price and its worth mentioning that the book and t shirt would make a great Fathers Day present in a couple of weeks time. Ordering details are on the home page. I enjoyed watching the two part Queen Days Of Their Lives documentary on BB2 which was excellently put together. I was a fairly big Queen fan up to around the Jazz ablum. I’m probably a bigger fan of the Queen story than their music though they have made some great tunes – for some reason I don’t quite connect with them on an emotional level as other acts. That said, their story is a captivating one and the documentaries captured it really well. The unearthing of two rare Top Of The Pops clips was quite a coup – allegedly they were taped by British comedian who being an early investor of a video recorder, taped some of his shows and ran into Top of The Pops. Wonder if anyone out there taped the one and only UK TV appearance of Led Zeppelin performing Communication Breakdown on How late It Is on the evening of March 21st 1969…now that would be a find. With half term holiday upon us the Lewis clan -that’s the good lady Janet, the boy Adam and his mate Josh, got on the train and ventured down to Brighton for the day. One of our favourite haunts – a walk down the Laynes and a wander on the beach recharged the batteries in amongst all the TBL packaging. I even had a result on a couple of vinyl pieces tucked away in one the last record shops standing in the area. 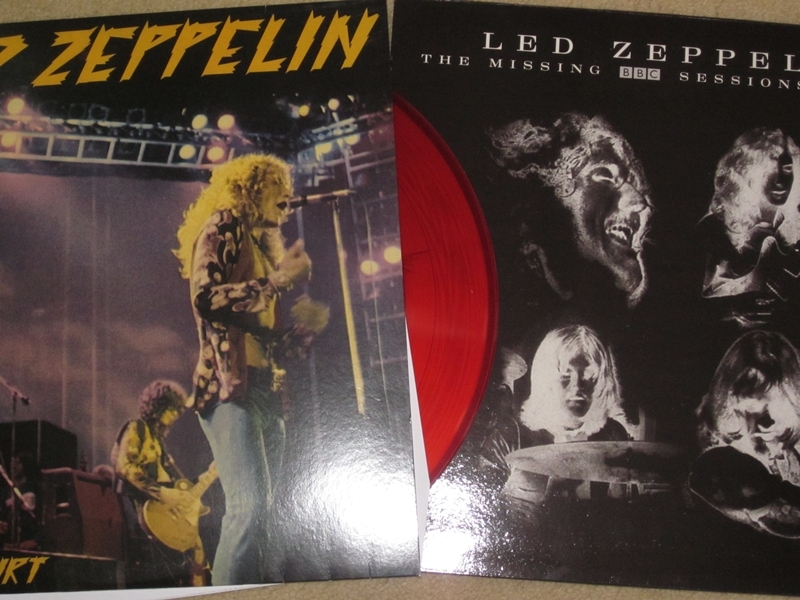 I am a sucker for the series of reissued Led Zep bootleg LP’s that are surfacing on vinyl and was very pleased to come across a repackage of the legendary Earls Court Vols 1 and 2 on coloured vinyl no less and a lovely BBC Sessions set titled The Missing BBC Session Tracks that has the rare Alexis Korner session on amongst other bits –this lovingly recreates the original official BBC sessions art work but flips it to black. A man has to have his little treats! We were back to face something of a domestic crisis in our garage. The last few days its been increasingly populated by bees and a closer look at the back of the garage by the good lady (I was cowering in a corner!) revealed a whole nest of the little buggers. Cue arrival of pest control man to smoke them out and a bill that might thwart any further vinyl purchasers for a while. Ah yes the curse of the (not so) killer bees. There was however a couple of silver linings to all this: 1) Luckily I’d recently moved out the box of VHS tapes of the Page & Plant tours I had stacked right where the bees gathered.2) The pest control man observing the many boxes of Led Zeppelin books that adorns our humble abode, noted that his brother was a big Zep fan and may well be interested in a purchase. Not such a case of bees make honey but bees make (potential) money…and have already cost us money! Gary Foy has returned from his DC trip where he hooked up with Mark Harrison, Michaela Firth and visited legendary collector Brian Knapp and TBL contributor Larry M Bergmann jr. Apologies for the recent lack of news updates on the site- with Gary back we hope to be back on track. Look out for a news update with some exciting reports next week. Robert Plant and The Band Of Joy are now back out on tour from June 8th –if you catch them this summer we would welcome feedback,comments,reviews, pics etc –email them down to Gary at garyfoy@live.co.uk. 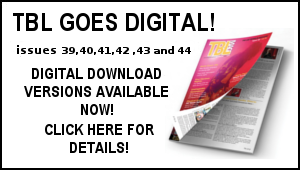 June is upon us and looks to be a very busy one with the TBL product distribution and book promotion on going. I have an interview on Planet Rock lined up the week after next and various others due and the local launch gig is at the Civic Theatre here on June 18th – I look forward to seeing all that can make it along. As mentioned last week I’ll be combining all that this month with the writing and researching of a major feature on The Who’s Next album. Tomorrow is our Sam’s 21st birthday. I’ve told this story before but on this milestone coming of age it seems well appropriate to run it again. These are the circumstances Sam entered the world in 1990 and yes you’ve guessed it, there’s something of a Zep association involved. 21 years ago on Monday June 4th 1990 I awoke with the prospect of a couple of Robert Plant gigs ahead over the next two nights. These were the London dates Robert was playing in support of the Manic Nirvana album. Tickets were sorted, arrangements made – I was going with my good friend Terry and a couple of the boys I worked with and planned to hook up with Gary Foy and the TBL crew in Hammersmith.. The good lady Janet was pregnant and our first born was due in July. Well it didn’t quite work out like that. On that morning of June 4th twenty one years ago , Janet informed there were stirrings… and sure enough there were. Off we went to Bedford North Wing hospital where we were informed that our forthcoming bundle of joy was ready to enter the world. With all notions of the gig ahead banished (honest!) I steeled myself for a lengthy labour (well not me as it were!) Things moved quickly and at 2.30 pm with impeccable timing our daughter Samantha Elizabeth was born. A lot of you out there know the rest… Sam is tiny and beautiful….mother and baby are doing well…anxious new father will only be in the way and heads for…yes you guessed it Hammersmith Odeon – arriving to the shock of Terry, Gary etc just in time for the gig. This was the only time I’ve ever seen R. Plant upstaged – as good as he was he didn’t quite match the afternoon proceedings! Pushing it a bit more – I was back the next night for gig number two with Terry celebrating Sam’s birth with a large intake of Directors ale. Later in the month I was at Knebworth with Mr Foy for the Robert & Jimmy’s reunion. What with the World Cup Italia 90, World in Motion at number one (Cue the John Barnes rap : ‘’You’ve got to hold and give – but do it at the right time – You can be slow or fast but you must get to the line’’) – that June of 21 years ago was some month. Sam will be in Norwich partying tomorrow and we will be skyping at some point to speak to her. 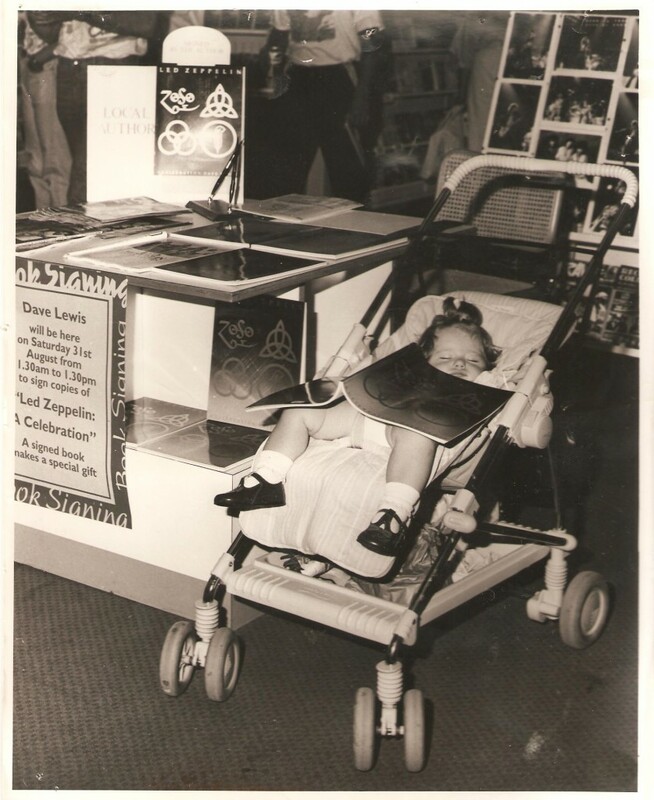 I’m glad to say the rather fraught entry to the world has not affected her too much – or the intervening years of having to put up with Dad’s passion, (she had no interest in my Celebration book signing in 1991 as can be seen!). Sam however has admirably developed her own her own passion for the written word and hopes to use that skill ahead in some format as she graduates from UEA in Norwich this summer. Happy 21st birthday Sam from all here and have a great time! Happy Birthday Bonzo and Sam. Happy Birthday Sam..cute at one year old and still cute at 21!! Pass on Best Wishes to Sam on her 21st. Those years sure fly! Happy Birthday Sam, a chip off the old block eh?! 21 years later, we’d better have another pint or 2 of Directors in the Devvy to celebrate then mate. What a momentous two nights they were ! Will pass on B-Day congrats to Sam tomorrow. Received “Feather in the Wind” on Bonzo’s birthday! Thanks Dave, what a timing! !